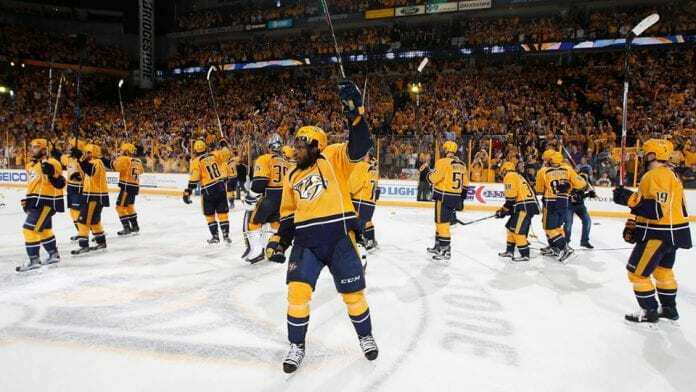 The Nashville Predators saluted their fans after defeating the St. Louis Blues 3-1 to advance to the Conference Finals. When the National Hockey League added the Nashville Predators 18 years ago, there were numerous skeptics who labeled it little more than a money grab by greedy owners. Granted, they did make millions in expansion fees, but the feeling was the NHL still had room for growth, and that the league could make it in non-traditional markets like Nashville, Phoenix, and states like Florida and North Carolina that had long been bastions of minor league clubs, but never exactly viewed as ripe for a big league team. It took a long time, but the Predators are now in the Western Conference Finals. Over that 18 years the team’s popularity has steadily grown, even as the organization overcame a rough period when it looked like they might be purchased and relocated. This past season the Predators sold out every game, and all the home playoff games have been standing room only. Now they are being noticed in national newspapers, featured on ESPN and in such publications as the Sporting News and Sports Illustrated. Of course, there remain the cynics, skeptics and elitist types always ready to bash the newcomers to the party. The Sporting News unloaded on WSMV-4 for the hideous (in their view) error of saying that the Predators were headed to the Stanley Cup Finals. First, they’re going to the Western Conference Finals. Second, as the Sporting News huffily cited, it is called the Stanley Cup Final, not Finals. That’s the NBA, and heaven forbid there be any comparison between the two leagues. Even if the NHL commissioner Gary Bettman used to work for the NBA, and the NBA’s ratings are at least twice and sometimes three times larger than the NHL’s. The stuffiness of some hockey people rivals that of soccer buffs, who disdain any and all sports except their beloved sport and its endless array of 1-0 and 2-1 games. Still, the Predators’ arrival center stage is enjoyable and instructive on several levels. It has demolished the notion that only football and college sports can succeed in Nashville. The Predators rise is being closely followed in many quarters and communities across Nashville. No, you still won’t see as many Predators’ jerseys as UT or Titans, but you are seeing more of them and on all types of people. Hockey is also being discussed in places that it always wasn’t, and attracting fans that it didn’t. The biggest knock on hockey for decades is that it was an all-white sport with a largely Canadian playing constituency. The league is now about as global as an ice-centered sport can be, with players from throughout Europe, Russia, and Scandinavia, as well as Canada. There will never be an influx of Black players, but there are more now than ever before, and the league has made public its desire to be seen as a diverse, welcoming sport. The Predators have previously had both Joel Ward and Seth Jones on their squad, and used both heavily in marketing. 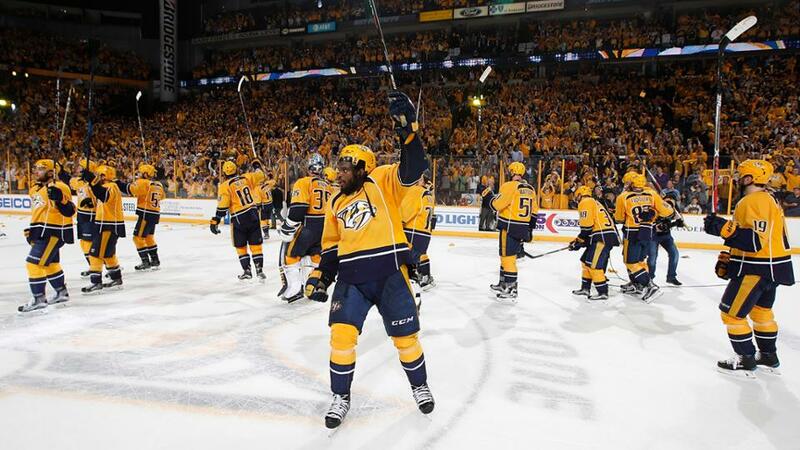 Last summer general manager David Poile made a trade for the best known Black player in the sport, defenseman P.K. Subban. He’s also one of the league’s stars period, and has proven enormously popular in his first season in Nashville. Despite missing a good chunk of the year due to injuries, Subban has shown that making the trade, which forced the team to relinquish popular captain and defenseman Shea Weber. was a smart move. Now the Predators move on to face either Anaheim or Edmonton, and possibly later to the Stanley Cup Final. But win or lose, they’ve already won the bigger battle. Hockey is now firmly established in Nashville for decades to come, with the Predators also on firm footing as one of the league’s premier teams.